Given how information technology has proliferated into every aspect of our lives, it is no surprise that the German national football team has been using big data in an early adoption phase for preparation and post analyses of the matches during the World Cup 2014 in Brazil. The technology comes from SAP in the form of “SAP Match Insights” a HANA based platform that is intended to facilitate the analysis, training and preparing for tournaments. It also better enables coaches to make sense out of vast amounts of data to find and assess key situations in each match to improve player and team performances. The insights are also aimed to be beneficial for the media, enabling them to deliver a better informed commentary. 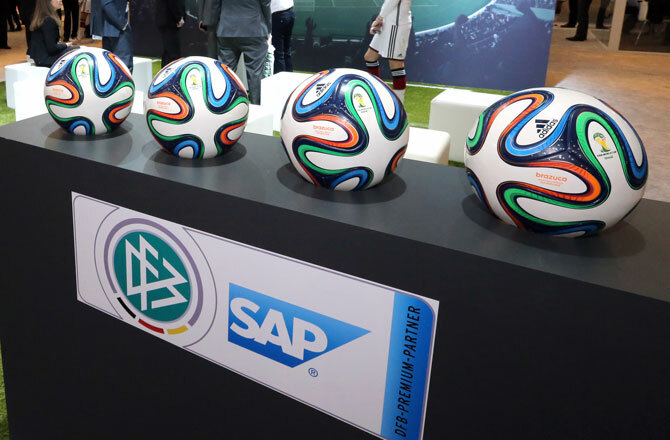 In 2013, SAP and the German Football Association (DFB) announced a partnership to improve the business processes of the federation. Recently, this partnership has been extended to also co-innovate on software-based solutions to enhance on-field performance of Germany’s national football team. SAP Match Insights is the first project with this intent. “SAP’s involvement has transformed the football experience for coaches, players, fans, and the media,” said Oliver Bierhoff, manager of the German national football team. “Imagine this: In just 10 minutes, 10 players with three balls can produce over 7 million data points. SAP HANA can process these in real time. With SAP, our team can analyze this huge amount of data to customize training and prepare for the next match. “Big Data is an incredible resource for coaches and players to contextualize information and draw well-informed conclusions to optimize training and tactics,” said Fadi Naoum, senior vice president, Application and Innovation Head of Sports and Entertainment at SAP. According to SAP, the German national team used this technology before its world cup game against Portugal where Germany beat Portugal 4-0 in that Group G game. “Oliver Bierhoff told us that prior to the match against Portugal; for example, Jérôme Boateng received several key scenes with Cristiano Ronaldo on his app so he could study his every move in the penalty area,” said. Kamila Joanna Laures, public relations manager for sports and entertainment at SAP. “Of course we’d like to believe that the German team's recent success at the world cup has also been helped by the power of data software support. At the end of the day; though, it is still the players who score,” Laures noted.